Wiehl-Bomig, Germany, April 2019. In March 2019, REIKU GmbH celebrated its 50th anniversary. It was back in 1969 that company founder Hans Hennemann arranged for his firm to be entered in the commercial register. At that time, the company produced zip-on plastic sheathing products in the courtyard of a city house in Gummersbach to the east of Cologne. The name REIKU is derived from the German "Reißverschluss-Kunststoff-Ummantelungen", which basically means "plastic sheathings with a zip closure". Through this registration, Mr. Hennemann laid the foundation stone for the continuous development of this niche supplier to become an internationally successful medium-sized company. With 47 employees, including five trainees, the company is now one of the most innovative and diversified developers and producers of high-quality cable protection systems for robotics and automation. Its customers include, in addition to users and assemblers, industry-leading manufacturers of cobots and large industrial robots from producers including ABB, Comau Robotics, Fanuc, Kuka, Universal Robots and Yaskawa. Peter Sailer, who shares the company management with David Guitton, says: "In our industry, innovative strength, fast and flexible reaction to changing demands, and an uncompromising commitment to consistently high quality are key. In meeting these requirements, we and our customers benefit from our decades of experience in the extrusion of tubing and the design and production of injection moldings. As a result and thanks to the careful selection of materials, we create the best possible conditions for preventing damage to the cable protection. This is our contribution to prolonged, interruption-free running times for cost-efficient production in tough industrial conditions. At the same time, it forms the basis for our company's success, which, as our current order situation shows, should also continue in the future." REIKU's product portfolio covers more than 8,000 different items and individual components that protect electrical wiring, cables and other components from contamination and chemical, thermal and mechanical stress. The production figures are impressive: In 2018, the company processed well over 400 tons of plastics granules into nearly 2,400 km of tubing and several million injection moldings. The portfolio is focused not only on the range of plastic tubings with their application-specific variations, but also on the flexible, highly stress and wear-resistant REIKU jointed tubing cable protection system for static and dynamic applications. 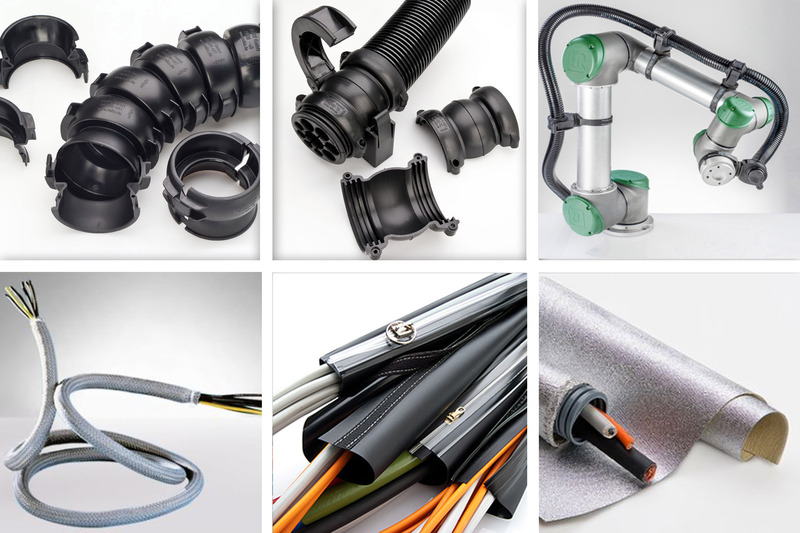 With a large variety of nominal widths, variants and accessories such as gripping clamps, clips, end-pieces, connectors, joint connections and cablestars, REIKU is one of the European market leaders in this field. Supplements to the current product range include system sheathings with zip closure, the REIKU heat protection materials GLASO, GLASIL and Kevlar for applications in which cables and components have to be protected against temperatures of up to 800 °C, and fine-braided tubings as a fast and clean solution for the protection of cables that have to be laid flexibly or retain their flexibility. In view of the continuously increasing market success, David Guitton adds: "Among the most important applications of our products are industrial robots and, in particular, extremely flexible cobots, in which our in-house development team works closely together with Universal Robots, Kuka and others. Especially here we are seeing rapidly growing demand for our cable protection systems, which is stretching the production and storage facilities at our site in Wiehl-Bomig to their limits. To ease the situation, we intend to acquire more building land in the direct vicinity of our existing site before the end of this year."